Nearly half of all Americans over the age of six, or 48.8% of the US population, participated in outdoor recreation at least once in 2016. That equates to a total of 144.4 million people – two million more people than participated in 2015. These findings are part of the Outdoor Foundation’s recently-released Outdoor Recreation Participation Report, the leading report tracking American participation trends in outdoor recreation with a focus on youth and diversity. The Outdoor Foundation’s annual Outdoor Recreation Participation Report helps the outdoor industry, public agencies and community organizations better understand the trends in outdoor recreation participation, enabling groups to address Americans inactivity crisis and the disconnect between children and the outdoors. The report is based on an online survey of more than 20,000 Americans ages six and older and covers 114 different outdoor activities, making it the largest survey of its kind. While 10.6 million Americans returned to or started participating in one or more of the outdoor activities measured, 8.6 million stopped. That equates to a net gain of 2 million total participants and a churn rate of 6%. Participants went on a total of 11.0 billion outdoor outings in 2016, a decrease from 11.7 billion in 2015. 21% of outdoor enthusiasts participated in outdoor activities at least twice per week. Running, including jogging and trail running, was the most popular activity among Americans when measured by both number of participants and by number of total annual outings. 19% outdoor participants lived in the South Atlantic region of the US, making its population the most active in outdoor activities. Walking for fitness was, by far, the most popular crossover activity. 45% of all outdoor participants also walked. The biggest motivator for outdoor participation was getting exercise. The participation rate among males ages 6 to 12 and ages 13 to 17 increased by one percentage point since last year to reach 65%. Participation among males ages 18 to 24 dropped by two percentage points to 54%. Participation among females experienced opposite results from 2015 to 2016. Participation rates dropped by one percentage point among females ages 6 to 12 and ages 13 to 17. Young adults, ages 18 to 24, added 3 percentage points to reach 56%. Data shows that adults who were introduced to the outdoors as children were more likely to participate in outdoor activities during adulthood than those who were not exposed to the outdoors as children. In fact, 37% of adults who were introduced to the outdoors during childhood grew up to enjoy outdoor activities as adults. Only 16% of adults who do not currently participate in any outdoor activities had outdoor experiences as children. Participation among Asians has increased by 1.2% over the past five years while Caucasian participation has declined by 0.9%. Black and Hispanic participants went on the most average outings per participant. Running was the most popular outdoor activity for almost all ethnicities; however, white participants participated in fishing at a higher rate than running. 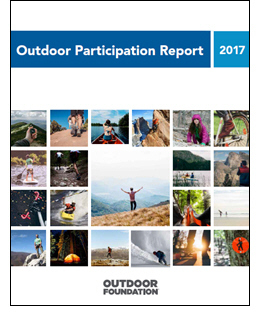 To download a complete copy of the 2017 Outdoor Recreation Participation Report, visit The Outdoor Foundation website. About the Outdoor Foundation & Outdoor Nation: The Outdoor Foundation is a not-for-profit organization dedicated to inspiring and growing future generations of outdoor enthusiasts. Through groundbreaking research, action-oriented outreach and education programs, the Foundation works with partners to mobilize a major cultural shift that leads all Americans to the great outdoors. In 2010, the Foundation launched Outdoor Nation, a pioneering initiative that aims to empower young leaders to champion the outdoors on campuses and in communities across the United States. For more information visit: OutdoorIndustry.org/participation/outdoor-foundation and OutdoorIndustry.org/outdoor-foundation-s-mission/outdoor-nation. About Outdoor Industry Association: Based in Boulder, Colo., with offices in Washington, D.C., Outdoor Industry Association (OIA) is the leading trade association for the outdoor industry and the title sponsor of Outdoor Retailer. OIA unites and serves over 1,200 manufacturers, supplier, sales representative and retailer members through its focus on trade and recreation policy, sustainable business innovation and outdoor participation. For more information, visit www.OutdoorIndustry.org.